In early 2013, Jared Cheek and Jason Nickey came across a weird little record while working at the Bloomington, Indiana record shop, Landlocked Music. 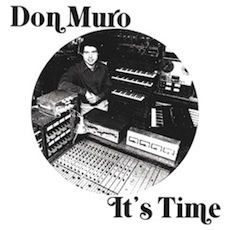 Titled It’s Time, the 1977 LP featured a black-and-white image of the man responsible for all the sounds within, songwriter Don Muro, surrounded by various synths and audio gear. “Looking at the front cover [Jason] thought it seemed like something that I might be into, so we put it on and I loved every song on it,” Cheek explains. Googling Muro’s name, Cheek found the artist still active, both as a performer and music educator. He shot off an email, inquiring if Muro would be interested in Cheek’s label, Flannelgraph Records, reissuing It’s Time. Muro promptly responded, and Landlocked offered to co-release the LP. “I’m assuming that the process of reissuing a record from 36 years ago is normally not this painless, but Don’s enthusiasm and helpfulness has made it a real joy,” Cheek says. The reissuing process isn’t the only thing atypical about the story. It’s Time is a genuine original as an album. Its songs ping-pong between oscillating synth pop, ambient soundscapes, and crunchy AOR-inspired power-pop rippers; its lyrics blend charming naivety and smirking, cocksure glances. It’s no “outsider record” by in traditional terms — Muro clearly knows what he’s doing with a pop song — but it still resonates as far left of the sounds dominating the burgeoning FM airwaves of the day. AD: In 1977, the synthesizer was becoming a more common instrument in pop music, but it still had an outsider quality. What about the synth attracted you, and did you get the sense that it would define your album? 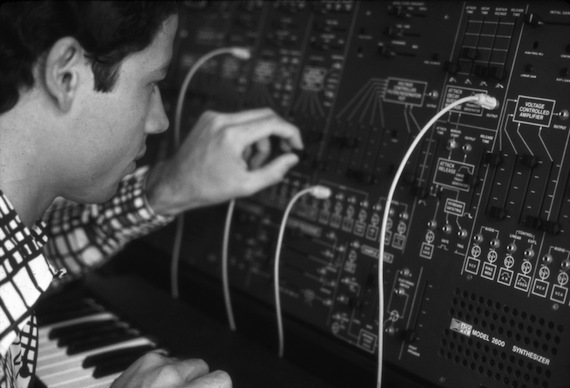 Don Muro: I never thought that the synthesizer playing would define the album. For some reason I never considered the synthesizer as having an outsider quality. I have always loved the sound of oscillators and feedback. I was somewhat familiar with electronic music from the 50s and 60s, but in 1968, Switched-On Bach, in addition to being tonal electronic music, showed what could be done with multi-track recording. Bowie opened my ears with the synthesizer on The Man Who Sold the World, and a few years later Todd Rundgren pretty much defined synth/pop/rock. AD: You released the album yourself on your own label, Sine Wave. Did you ever release other albums on the label? Don Muro: I released Anthology, my second album, in 1981. By then I was immersed in live synthesizer playing and had pretty much stopped playing guitar and singing. Even though I was still composing and recording, my album releases stopped for several years while I was doing a variety of things — performing solo synthesizer concerts, consulting with manufacturers, and teaching graduate workshops at universities. It’s Time was re-released on cassette in the mid-80s, and a new album (with the creatively bankrupt title of Reflections) was released on cassette in 1995 and later on CD. In addition, my son and daughter have released a few projects on Sine Wave as well, so the label is still alive. AD: Tracks like “Sweet Little Thing,” “Want You To Know,” and “Lay Low Day” have a pronounced rock feel to them. What kind of guitar record were you listening to back in 1977? Don Muro: There were so many guitarists I enjoyed at that time and earlier — Leslie West, Ritchie Blackmore, Brian Jones’ rhythm guitar, early Johnny Winter, Eric Clapton (I quoted the riff from “Layla” in “Squash”), to name a few. They had vastly different styles, but they all had such great tone. And then Tom Scholz [the leader of Boston] came along with his guitar orchestra. I was driving on Ocean Parkway on Long Island when I first heard “More Than a Feeling,” and I immediately pulled over and turned off the engine so I could hear better. The layers, the arrangements, the vocals (especially the high note elisions into the guitar riffs) — it was stunning at the time. AD: You played every instrument, wrote all the songs, and arranged all of It’s Time. How long did the process take you? Don Muro: It’s hard to say, because I worked on the material sporadically over a two year period from 1974 — 76. Some songs took a while to compose and arrange. Other, such as “Music Box” and “Russian Dream,” were composed and recorded in one day. AD: Your bio boasts that you played Disneyland. I’m curious about the story behind that. Don Muro: I performed at a music conference somewhere in the late 70s and John Anello, who worked for Disney, invited me to present workshops for the college music students who worked at the parks in the summer. The students were handpicked from top schools — Miami, Berklee, North Texas, and they could play. I was invited back a few times and on those visits I performed in the parks with their big band. It was a hoot. AD: What have you been working on musically since It’s Time?